For each film, we'll list out all of the actors who appear in it. The dataset called Films should just contain the FilmId and FilmName fields, and be based on the tblFilm table. 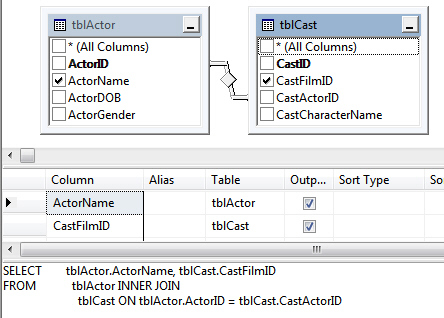 The dataset linking the actor and cast tables. Now create your report table, and set the expression for the second column so that it joins together all of the actor names from the Actors dataset where the CastFilmId field value equals the value of the corresponding FilmId field in the Films dataset! The expression should use the JOIN and LOOKUPSET functions - see manual for help! When you've got this working, close down your report!